When you are developing a complex application, be it web, mobile or whatever, it’s useful to be able to launch any screen immediately and independently from the rest of the system. By “screen” I mean a web page, an Android activity, a Swing component, or whatever it is called in the UI technology that you are using. 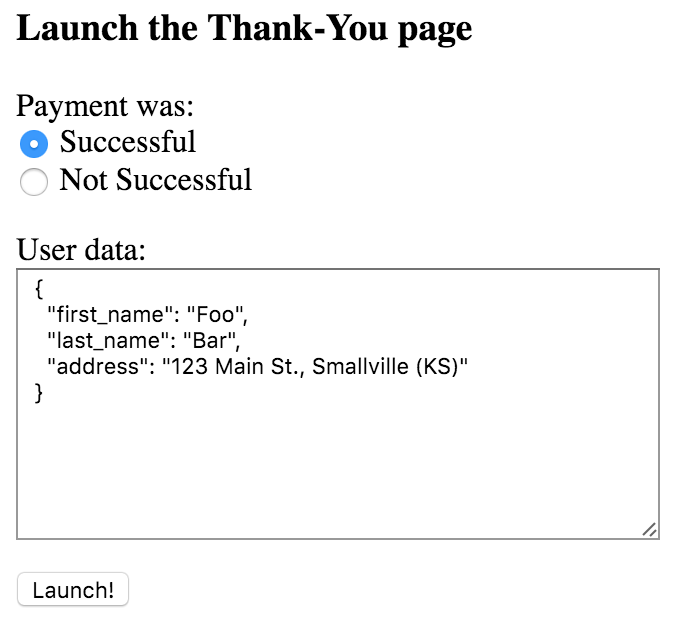 For instance, in an ecommerce application, I would like to be able to immediately show the “thank you for your purchase” page, without going through logging in, adding an item to the cart and paying. The design of the screen is cleaner and less expensive to maintain. Note that the form starts pre-populated with default data, so that I can launch the desired screen with a single click. Making screens decoupled from their data sources does, in my opinion, generally improve the design of the application. Making things more testable has a general positive impact on quality. This entry was posted on 29 March 2016 at 13:44	and is filed under Agile. You can follow any responses to this entry through the RSS 2.0 feed. You can leave a response, or trackback from your own site. Hi Matteo, I have done the same thing in the past with an application based on Adobe Flex. Is “testable screens” a known pattern? I am sure this idea is not new; however I am not aware of it being discussed as a published pattern. Take care!